Description: Barician is another captain of the Skorned; particularly of the mage division. 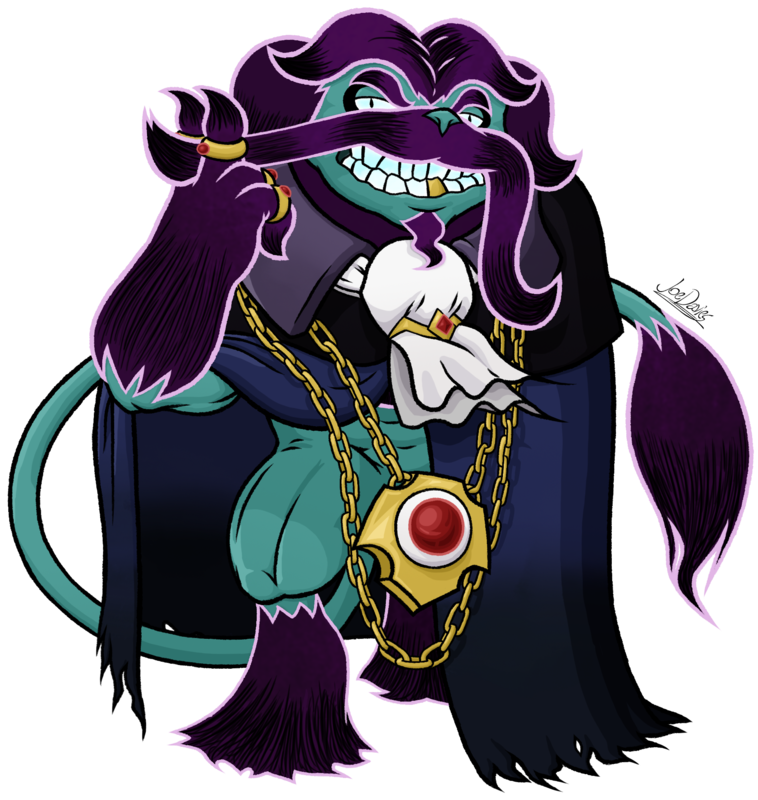 He boasts great magical prowess, glittering golden accessories, and one suave moustache. He revels in his superiority and he wants to make sure everyone knows it. He is known among the ranks for being so full of himself, that he loves to hear himself talk; hence his very long speech patterns. He decorates his dialogue with big-sounding words to make him sound more refined and elegant, but he is no less sadistic than any other Skorned. In fact, his second biggest delight aside from talking about himself is his desire to torture, because he loves leaving impressions, and doing so in painful ways is how he leaves his mark. Rumors among the Skorned say that Barician wants to overthrow Skolliath one day, believing dominance over the Skroned should belong to him, but even he quivers at the thought for Skolliath has control over all the lives of the Skorned, and he does not want to upset his overlord, lest his brilliant magnificence be completely torn down. Or worse. Barician is a Mage Skorned. And a very powerful one at that. He has a whole lexicon of spells documented in a large tome, but he doesn’t bother to bring it with him because he has memorised and mastered all of them; he is that powerful. However, despite being proficient with magic, Barician is not much of a fighter, and would prefer to sit back and watch as others fight his battles. For two reasons; one is that, unlike most Skorned captains, Barician has only one weak armour point. He keeps it well hidden underneath his cape, but should it shatter, he’s done for. And second reason is, of course, he doesn’t like ruining his lavish attire or dark fur. Despite all this, it is not wise to go head-to-head with Barician in a magic battle for he is a strong opponent. He was tasked by Skolliath to apprehend most of the Bernumaids because they are very proficient in magic, meaning he can surpass them with his own abilities and foresight. Although, Barician was not happy about this, as apprehending the Bernumaids would mean going underwater, and he doesn’t like to get himself wet and ruin his lavish furs or coat. Confronting our heroes, Barician decides to let his men take care of the hostages, whilst he battles Ianassa in a magic battle. Appearance: Barician is a bit short to the average Skorned, but he has quite a large frame. He has a hunchback, and prefers to keep most of his body draped in a dark cloak. With the only thing that sticks out is his long tail. Most of his body is not covered with fur, aside from his head, forearms, torso, shins and tail end. And all of those fur portions are combed to an endless degree that they a smooth straight pattern to them. And they curve at the end to seem more elegant. Even his fingers, feet and ears are covered with lavish fur. What portions aren’t covered with fur reveal his turquoise blue body. He is dressed in a dark blue cloak that covers most of his body. And dressed on top of that are very garish accessories that only further accentuate his brilliance. He wears a cravat, an incredibly long necklace, and rings on all of his fingers; all adorned in gold and rubies. He even has a gold tooth. When Barician is fully dressed in hos cloak, the only parts of his body that are visible are his head and his tail. Beneath that cloak as well lies his sole armour weak point, but where could it be? – Barician’s name and mage status are actually based off of The Baron character in the fairy tale called “The Fish and the Ring”; which is the story that largely inspired the chapter of Aquapiper Academy. In the fairy tale, it describes The Baron as being also a magician. And Barician’s name came from a mix of those two occupations; BARon magICIAN = BARICIAN. – Barician’s appearance is also based off of any cartoonish representation of barons. But for the sake of reference, let’s say he was based on the character King Ceville from the video game ‘Ceville‘.